For the last decade, I’ve made predictions about how the year in SEO and web marketing would go. So far, my track record is pretty decent — the correct guesses outweigh the wrong ones. But today’s the day of reckoning, to grade my performance from 2017 and, if the tally is high enough, share my list for the year ahead. Breakeven or better means I make new predictions for the year ahead, and under that total means my predicting days are over. Let’s see how this shakes out… I’m not nervous… You’re nervous! This sweat on my brow… It’s because… because it was raining outside. It’s Seattle! Yeesh. #1: Voice search will be more than 25% of all US Google searches within 12 months. Despite this, desktop volume will stay nearly flat and mobile (non-voice) will continue to grow. 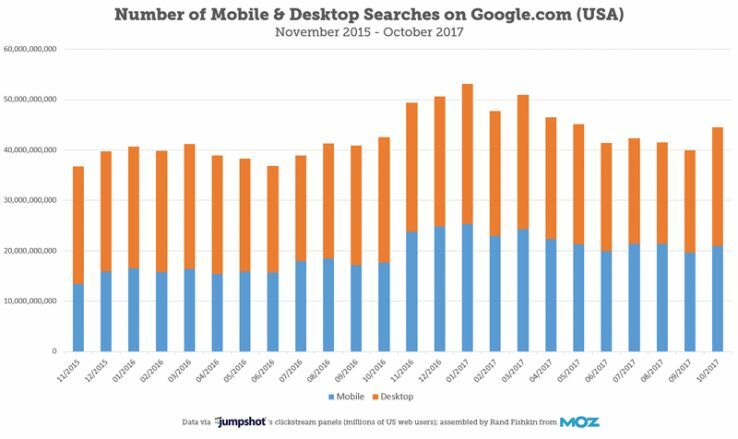 +1 – We have data for desktop and mobile search volume via Jumpshot, showing that the former did indeed stay relatively flat and the other kept growing. But, unfortunately, we don’t know the percent of searches that are done with voice rather than keyboards or screens. My guess is 25% of all searches is too high, but until Google decides to share an updated number, all we have is the old 2016 stat that 20% of mobile searches happened via voice input. #2: Google will remain the top referrer of website traffic by 5X+. Neither Facebook, nor any other source, will make a dent. +2 – Nailed it! Although, to be fair, there’s no serious challenger. The social networks and e-commerce leaders of the web want people to stay on their site, not leave and go elsewhere. No surprise Google’s the only big traffic referrer left. #3: The Marketing Technology space will not have much consolidation (fewer exits and acquisitions, by percentage, than 2015 or 2016), but there will be at least one major exit or IPO among the major SEO software providers. +2 – As best I can tell from Index.co’s thorough database (which, BTW, deserves more attention than Crunchbase, whose data I’ve found to be of far lower quality), Martech as a whole had nearly half the number of acquisitions in 2017 (22) versus 2016 (39). 2017 did, however, see the Yext IPO, so I’m taking full credit on this one. #4: Google will offer paid search ads in featured snippets, knowledge graph, and/or carousels. 0 – Turns out, Google had actually done a little of this prior to 2017, which I think invalidates the prediction. Thus I’m giving myself no credit either way, though Google did expand their testing and ad types in this direction last year. #5: Amazon search will have 4% or more of Google’s web search volume by end of year. -2 – Way off, Rand. From the Jumpshot data, it looks like Amazon’s not even at 1% of Google’s search volume yet. I was either way too early on this one, or Amazon searches may never compete, volume-wise, with how Google’s users employ their search system. #6: Twitter will remain independent, and remain the most valuable and popular network for publishers and influencers. +2 – I’m actually shocked that I made this prediction given the upheaval Twitter has faced in the last few years. Still, it’s good to see a real competitor (despite their much smaller size) to Facebook stay independent. #7: The top 10 mobile apps will remain nearly static for the year ahead, with, at most, one new entrant and 4 or fewer position changes. +1 – I was slighly aggressive on wording this prediction, though the reality is pretty accurate. The dominance of a few companies in the mobile app world remains unchallenged. Here’s 2016’s top apps, and here’s 2017’s. The only real change was Apple Music and Amazon falling a couple spots and Pandora and Snapchat sneaking into the latter half of the list. -2 – I should have realized Google will continue to use engagement data for rankings, but they’re not gonna talk about it. They have nothing to gain from being open, and a reasonable degree of risk if they invite spammers and manipulators to mimic searchers and click for rankings (a practice that, sadly, has popped up in the gray hat SEO world, and does sometimes, unfortunately, work). 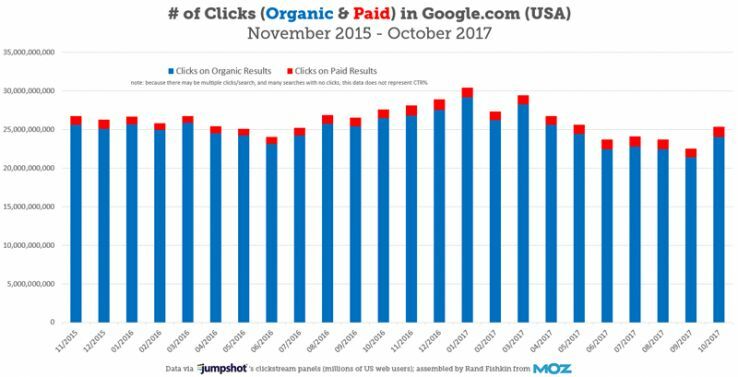 In 2017, we saw the start of a concerning trend — fewer clicks being generated by Google search on desktop and mobile. I don’t think that was a blip. In my estimation, Google’s actions around featured snippets, knowledge panels, and better instant answers in the SERPs overall, combined with more aggressive ads and slowing search growth (at least in the United States), will lead to there being slightly less SEO opportunity in 2018 than what we had in 2017. I don’t think this trend will accelerate much long term (i.e. it’s certainly not the end for SEO, just a time of greater competition for slightly fewer click opportunities). Facebook, Instagram, and Snapchat have all had success algorithmically or structurally limiting clicks off their platforms and growing as a result. I think in 2018, Twitter and LinkedIn are gonna take their own steps to limit content with links from doing as well, to limit the visibility of external links in their platform, and to better reward content that keeps people on their sites. Google Search Console is, slowly but surely, getting better. Google’s getting a lot more aggressive about making rank tracking more difficult (some rank tracking folks I’m friendly with told me that Q4 2017 was particularly gut-punching), and the SEO software field is way, way more densely packed with competitors than ever before. I estimate at least ten SEO software firms are over $ 10 million US in annual revenue (Deepcrawl, SEMRush, Majestic, Ahrefs, Conductor, Brightedge, SISTRIX, GinzaMetrics, SEOClarity, and Moz), and I’m probably underestimating at least 4 or 5 others (in local SEO, Yext is obviously huge, and 3–4 of their competitors are also above $ 10mm). I predict this combination of factors will mean that 2018 sees one or more casualties (possibly through a less-than-rewarding acquisition rather than straight-out bankruptcy) in the SEO software space. Voice search devices are useful, but somewhat limited by virtue of missing a screen. The Echo Show was the first stab at solving this, and I think in 2018 we’re going to see more and better devices as well as vastly better functionality. 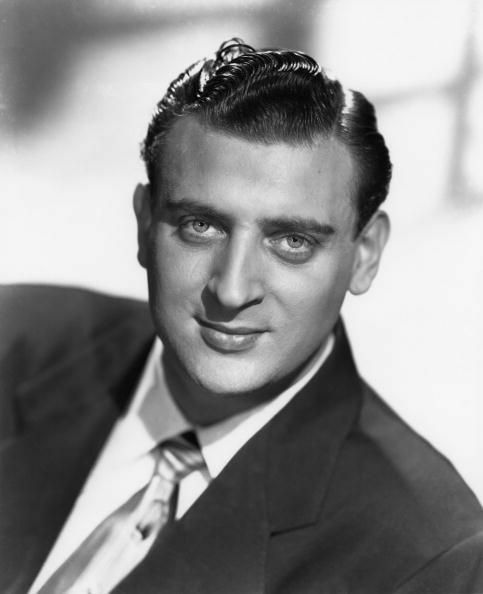 Even just the “Alexa, show me a photo of Rodney Dangerfield from 1965.” (see, Rand, I told you he used to be handsome!) will take away a lot of the more simplistic searches that today happen on Google and Google Images (the latter of which is a silent giant in the US search world). Amazon’s feud with Google and the resulting loss of YouTube on certain devices isn’t going unnoticed in major tech company discussions. I think in 2018, that turns into a full-blown decision to invest in a competitor to the hosted video platform. There’s too much money, time, attention, and opportunity for some of the big players not to at least dip a toe in the water. Side note: If I were an investor, I’d be pouring meetings and dollars into startups that might become this. I think acquisitions are a key way for a Facebook, an Amazon, or a Microsoft to reduce their risk here. Facebook ads on the web should be as big or bigger than anything Google does in this realm, mostly because the web functions more like Facebook than it does like search results pages, and FB’s got the data to make those ads high quality and relevant. Unfortunately, they’ve underinvested in Audience Network the last couple years, but I think with Facebook usage in developed countries leveling out and the company seeking ways to grow their ad reach and effectiveness, it’s time. I’m calling it. Mobile apps, for 95% of companies and organizations who want to do well on the web, are the wrong decision. Not only that, most everyone now realizes and agrees on it. PWAs (and straightforward mobile websites) are there to pick up the slack. That’s not to say the app stores won’t continue to generate downloads or make money — they will. But those installs and dollars will flow to a very few number of apps and app developers at the very top of the charts, while the long tail of apps (which never really took off), fades into obscurity. Side note: games are probably an exception (though even there, Nintendo Switch proved in 2017 that mobile isn’t the only or best platform for games). While it depends what you consider “the web” to be, there’s no doubt WordPress has dominated every other CMS in the market among the most popular few million sites on it. I think 2018 will be a year when WordPress extends their lead, mostly because they’re getting more aggressive about investments in growth and marketing, and secondarily because no one is stepping up to be a suitable (free) alternative. 35%+ might sound like a bold step, but I’m seeing more and more folks moving off of other platforms for a host of reasons, and migrating to WordPress for its flexibility, its cost structure, its extensibility, and its strong ecosystem of plugins, hosting providers, security options, and developers. Tragically, we lost the battle to maintain Title II protections on net neutrality here in the US, and the news is a steady drumbeat of awfulness around this topic. Just recently, Trump’s FCC announced that they’d be treating far slower connections as “broadband,” thus lessening requirements for what’s considered “penetration” and “access,” all the way down to mobile connection speeds. It’s hard to notice what this means right now, but by the end of 2018, I predict we’ll be feeling the pain through even slower average speeds, restrictions on web usage (like what we saw before Title II protections with Verizon and T-Mobile blocking services and favoring sites). In fact, my guess is that some enterprising ISP is gonna try to block cryptocurrency mining, trading, or usage as an early step. Over time, I suspect this will lead to a tiered Internet access world here in the US, where the top 10% of American earners (and those in a few cities and states that implement their own net neutrality laws) have vastly better and free-er access (probably with more competitive pricing, too). Which of these predictions do you find most likely? Which do you find most outlandish?